Rand Paul’s filibuster on drones demonstrates the perfect way to kill a policy. The last time most people saw Glenn Beck, he was hosting a Fox News show renowned for its use of a mobile blackboard. In white chalk on black slate, viewers learned that Barack Obama was building a private army, that the government would seize private land to peg a new post-dollar currency, and that the Arab Spring was an “Archduke Ferdinand moment” for Marxists. That was the old Glenn Beck. The new Glenn Beck calls himself a “libertarian” akin to Penn Jillette. His news site and online video channel brim with stories about heroic applications of the Second Amendment (“Wanted fugitive fatally shot by gun-toting Kansas farmer”), left-wing censorship (“Do you count as an extremist ‘patriot’?”), and politicians alternately heroic (Rand Paul) and vile (John McCain). 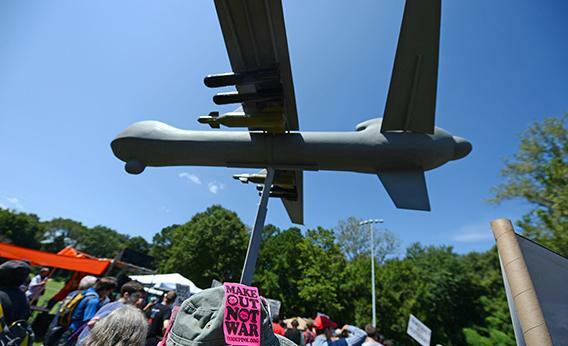 If you want the government to regulate or ban drones—for domestic surveillance, for warfare, for targeted killings of Americans—this is exactly how you want the politics to work. There’s no scrutiny of government surveillance or warfare programs unless those programs stir up left-right paranoia. When that paranoia crests, a bill can be stopped, or a ban can squeak through. Ask the poor lobbyists for REAL ID, or ask one of the tech lobbyists who thought the Stop Online Piracy Act was going to sail through. You can’t win one of these battles unless the lumpen talk radio fan thinks the government will use its powers to steal his freedom. Until this week, that was the problem facing anti-drone campaigners. One month ago, the Washington Post/ABC News poll asked voters whether they favored “the use of unmanned, ‘drone’ aircraft against terrorist suspects overseas.” Eighty-three percent said they did, and 65 percent said they favored even targeted killings of American citizens. That was more than a year after a drone attack killed al-Qaida’s “YouTube preacher” Anwar al-Awlaki and his 16-year-old son, American citizens both. Most Americans didn’t worry about that. So Paul gave them something to worry about. Unless the administration said otherwise, Paul argued that it was claiming indefinite authority to execute Americans. Any American. Maybe even you. “I don’t think the president would purposely take innocent people and kill them,” said Paul in his filibuster. “I really don’t think he would drop a Hellfire missile on a cafe or a restaurant like I’m talking about. But it bothers me that he won’t say that he won’t.” He invoked the shootings at Kent State in 1970, and asked whether the government could have used drones to kill Jane Fonda. A conservative who slapped a “Not Fonda’ Kerry” sticker on his Dodge Ram nine years ago didn’t hear a defense of anti-Vietnam War activists. He heard Paul, and thought about the government maybe targeting right-thinking Americans who rallied at Tea Parties. If that becomes the story, that’s how drone skeptics—whether they fear for their privacy or oppose targeted killings abroad—move the needle on a debate they were losing. Paul’s Thursday media tour went like a dream, but nothing he said helped him as much as the action in the Senate. Shortly before noon, Sen. John McCain and Sen. Lindsay Graham walked onto the floor for a short colloquy. The subject: Rand Paul’s wrongness. McCain read from a Wall Street Journal editorial condemning “Rand Paul’s drone rant.” Graham displayed one of those low-information, maximum-impact charts that make C-Span great, contrasting the number of American territorial deaths caused by al-Qaida to those caused by drones—2,751 to zero. Had Rand Paul forgotten 9/11?